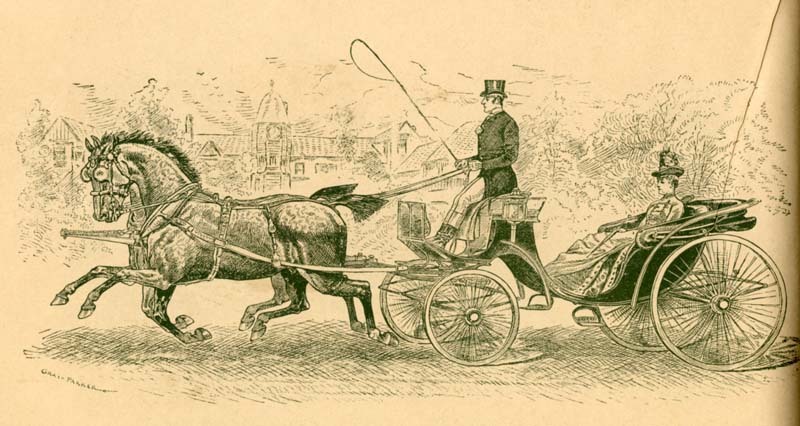 For our final look at the Gray-Parker illustrations in the 1891 Buckeye Buggy Co. catalog, we have three variations on a theme. “CABRIOLET — (Derivation: French, cabriolet, through the Italian, capriolo, kid, from the Latin capreolus, diminutive of caper, goat.) A name originally applied to a two-wheel vehicle used in France and Italy during the late seventeenth century, so named because of the capering or goat-like motion given to the vehicle by its long, springing shafts. The body, resembling an exaggerated comma or nautilus shell, was a relic of the cut-down coach body, thus relating the Cabriolet to the coach family. The Cabriolet eventually borrowed an additional characteristic from the coach in the manner of suspension, being hung from whip springs and C-springs. Popular at first among men of fortune, the Cabriolet came into common use in Paris as a public hack during the late eighteenth century. Shortly thereafter, it was introduced into London where, early in the nineteenth century, it was again put into limited service as a public carriage, and thus was the ancestral form of the two-wheel public cabs. “At about the same time, an English coach builder combined the two-wheel Cabriolet with the Perch-high Phaeton to produce a four-wheel vehicle known as the Cabriolet Phaeton. Later the vehicle came to the United States, where the word Phaeton was soon dropped from the name, leaving only the word Cabriolet, though the term now referred to a four-wheel vehicle. “On the Continent, the four-wheel Cabriolet was lifted to the dignity of a royal equipage. It was then driven with postilions, which necessitated the removal of the driver’s seat, and at the same time were added an ornate leather dash in front and a rumble seat for the groom behind. The French named this carriage the Victoria, in honor of Queen Victoria of England, probably about mid-century. Later, without altering the vehicle, a skeleton boot [driver’s seat] supported by iron stays was added above and in front of the dash. Thus the social significance in the skeleton boot of the Victoria, as compared to the paneled boot of the Cabriolet, is obvious. It should be remembered, however, that the Victoria properly belongs to the Cabriolet group, the latter name being applicable to carriages solely because of the resemblance of their bodies to the body of the original two-wheel Cabriolet. “In its final form the Cabriolet is a low, four-wheel, four-passenger (including driver) hooded vehicle without doors. Either one or two horses might be used, depending on the size of the carriage. The rear portion is made with a deep quarter, and the driver’s seat is on an elevated, paneled boot. Some carriage manufacturers applied the term Cabriolet if there was only a slight elevation to the driver’s seat, while they used the term panel-boot Victoria if there was a greater elevation of the driver’s seat. The top is generally over the back seat only, but some later types have extension tops that cover the front portion as well. The body usually is suspended on elliptic springs in front and platfrom springs in the rear, although in some instances elliptics were used in both front and rear.